The Titus pool from River Pools powered by Thursday Pools is a freeform shaped fiberglass pool available in two different sizes. The smaller version is a 26′ x 12′ pool and the larger size is a 33′ x 14′ pool that would be considered a medium sized freeform shaped fiberglass pool. 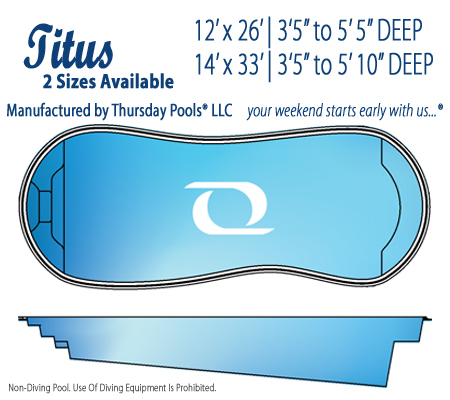 Both sizes of the Titus pool come with a deep end bench that has plenty of room for 4 – 8 people to sit back and relax. The shallow end has center entrance steps with a curved bench on either side of the steps. The remainder of the pool is open so you’ll have plenty of space to swim, float or play pool volleyball or basketball. The Titus 1433 and the Titus 1226 pools are built in Illinois by Signature Pools.